Celiac disease – Immune system attacks the villi in the esophagus when exposed to gluten protein gliadin, found in wheat, barley, rye, and sometimes oats. This lead to intestinal inflammation, flattening of the villi and long-term damage to the small intestine. 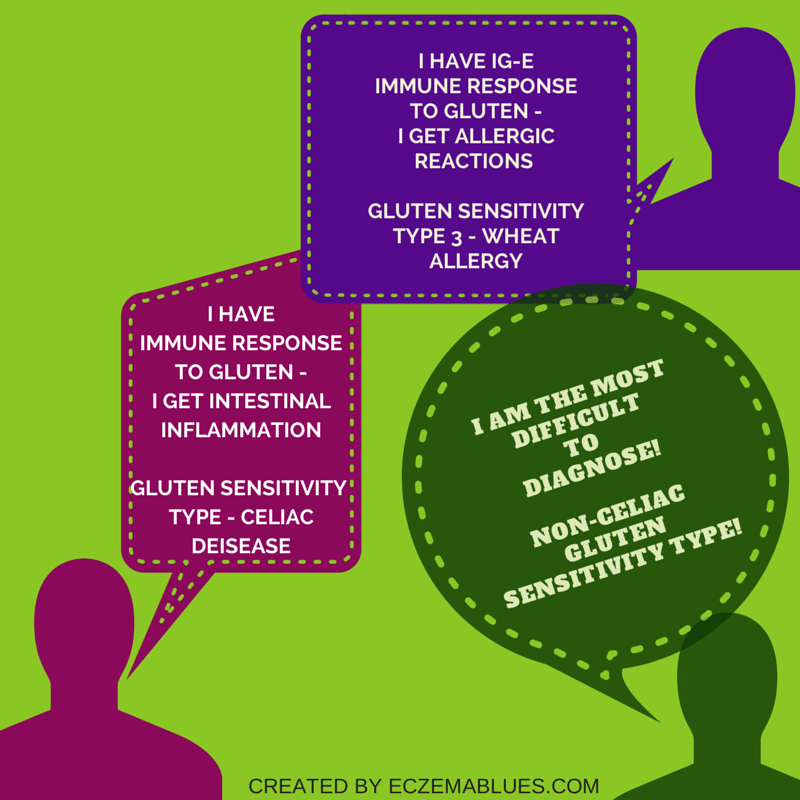 Non-Celiac Gluten Sensitivity (NCGS) – Diagnosis is not straightforward with no proven medical test. It is typically diagnosed after elimination of other similar conditions (for instance, wheat allergy, Irritable Bowel Syndrome) and after observation and further consultations. Wheat Allergy – Involves an immune Ig-E mediated reaction to the wheat protein, can be diagnosed via allergy test. It was debatable in 2014 then as to whether non-celiac gluten sensitivity (NCGS) even exists as (i) it is difficult to diagnose NCGS, and (ii) some studies concluded that it is actually sensitivity to FODMAPs rather than NCGS. (Gluten-containing grains are high in FODMAPs (fermentable oligo-, di-, and mono-saccharides and polyols) which are sugars/ carbohydrates that tend to be poorly digested, e.g. frutose. Almost a year later in 2015, we want to examine (i) whether non-celiac gluten sensitivity (NCGS) is a clinical entity (ie we are sure there’s such a medical condition) and (ii) its impact on eczema or skin rash. Methods: 17 patients affected by NCG, median age 36, 76% females, with itchy rash similar to eczema, psoriasis or dermatitis herpetiformis; wheat allergy and celiac disease tests were carried out to confirm that these 17 patients were not suffering from these. In this paper, non-celiac gluten sensitivity is stated as a clinical syndrome characterized by both intestinal and extraintestinal symptoms, which are responsive to gluten (wheat) withdrawal from the diet. Its estimated prevalence is 3% to 5% and a syndrome from multiple factors. From this paper, a diagnosis pathway was suggested to determine if one suffers from NCGS. 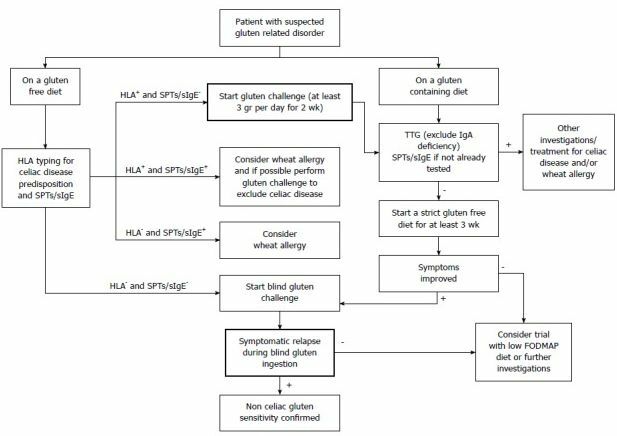 The blind gluten challenge remains a ‘gold standard’ for diagnosis; if going on a strict gluten free diet, it is maintained for at least 3 weeks to observe if symptoms improve. June 2015 Study – Diagnosis of Non-Celiac Gluten Sensitivity (NCGS): The Salerno Experts’ Criteria; The criteria is similar to above, with varying guidelines on the duration of gluten free and introduction of gluten diet. Various research had linked NCGS to female gender and adult age. It seemed from recent studies that NCGS remained a syndrome without an easy way of diagnosis. The latest study that noted an association between gluten and skin rash would likely be considered as being on a small scale. However, the possibility of skin rash linked to gluten cannot be dismissed and more collaboration between dermatologist and gastroenterologist would increasingly be seen as more patients suspect gluten as a source of their skin problems. What’s your experience with gluten? Do you think your child has gluten sensitivity? Share in the comments and we can all learn from it!